Tottenham boss Mauricio Pochettino has warned nobody is safe at the club as he looks to build a side capable of finishing in the top four of the Premier League next season. Spurs have missed out on Champions League qualification as they sit sixth, 10 points off fourth with two games remaining. "Always you need to analyse the last season," said Pochettino. "Nobody is sure that they are staying at the club." After Gareth Bale's £85m move to Real Madrid two years ago, Tottenham brought in Roberto Soldado, Paulinho, Vlad Chiriches and Etienne Capoue, but they have struggled to make a significant impact. Defenders Federico Fazio and Ben Davies, as well as midfielder Benjamin Stambouli have been unable to make much of an impression since being signed by Pochettino after he became Spurs boss last summer. 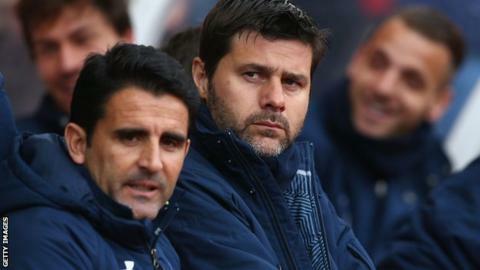 Pochettino accepts lessons must be learned from past mistakes in the transfer market if the club is to enjoy success in the future. "We need to look forward and we need to learn from the past," he added. "We have a plan for the development in the next few years and we need to deliver it."